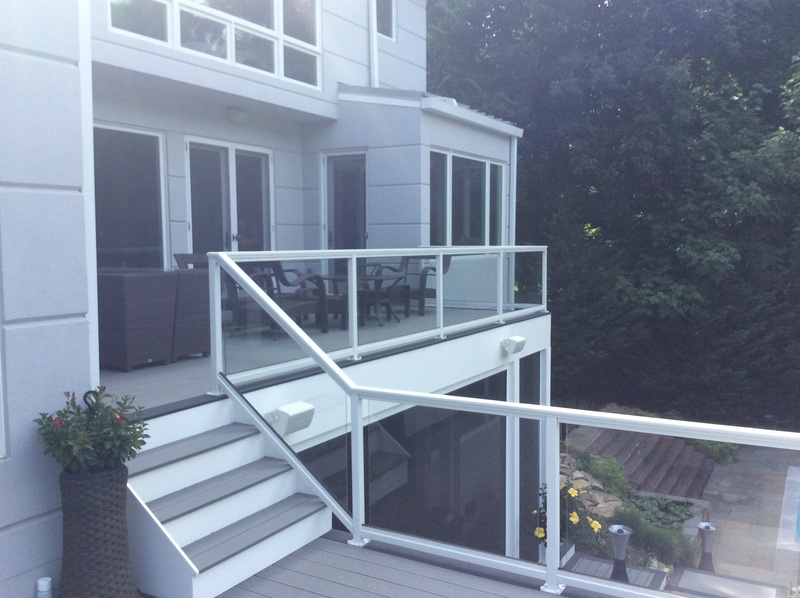 Archadeck of Central Maryland’s most current project, an outdoor living combination space takes us to Bethesda, MD. The homeowner’s existing space, a simple deck, lacked style and versatility…two characteristics which are needed most for homes in the Bethesda and surrounding areas. Considered to be one of the most affluent and highly educated communities in the United States, Bethesda is situated adjacent to Washington, D.C. and is an urban core of Montgomery County, MD. It is a vibrant and historic town, making it a popular destination for shopping, sightseeing, dining and artistic and cultural events. 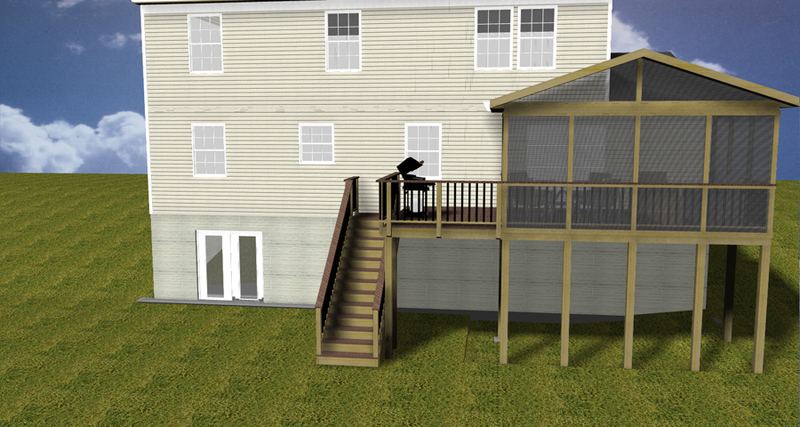 As you can see from the before picture, the simple deck currently provided a space for minimal seating and the barbecue grill. During our consultation with the homeowners we discussed their wants, needs and budget to obtain a better understanding of the ultimate outdoor living area they desired. Based upon that discussion, we suggested a combination space which would provide the best of both worlds…an open area for full sun exposure and an enclosed area for protection from the elements and pesky insects. 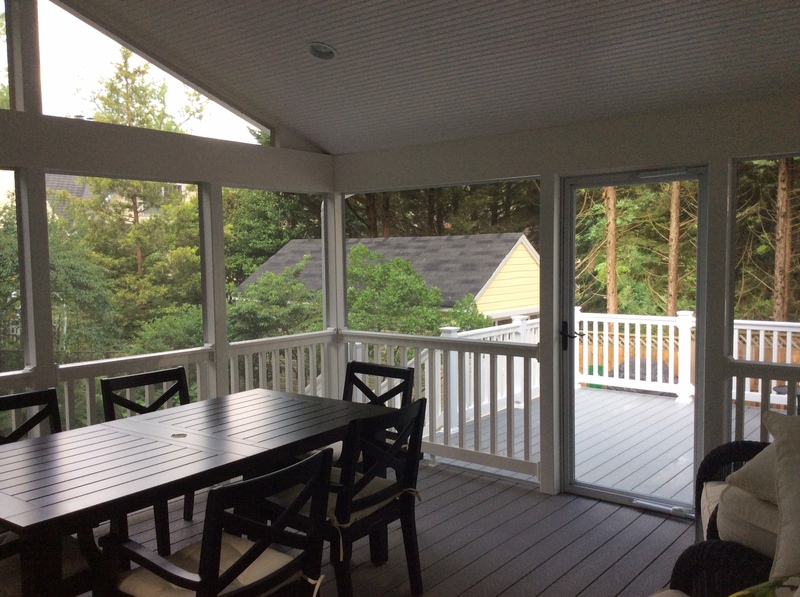 The homeowners agreed and the final outdoor living space was created with a deck and screened porch addition. Additionally, for enhanced charm and character for the overall design of the area, we included a paver sidewalk designed with a running board look similar to the historic streets and alleyways of Alexandria. 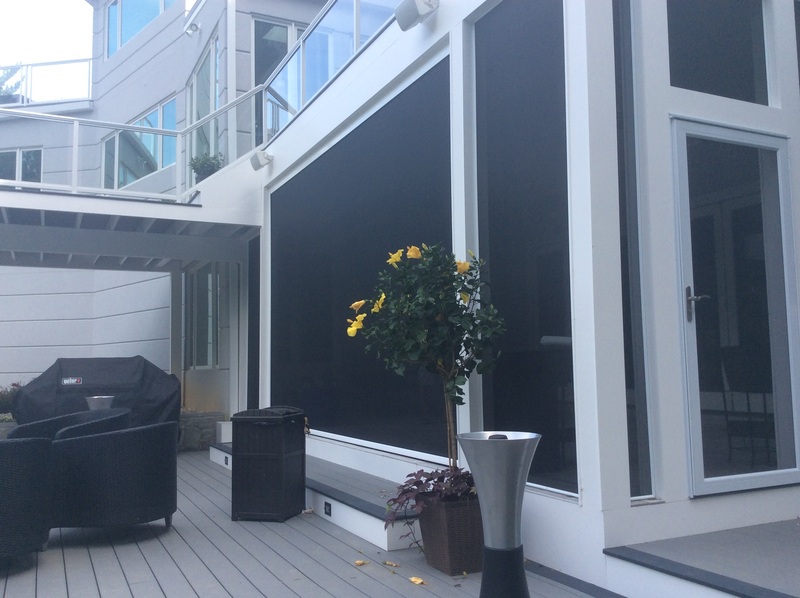 With this updating of the outdoor living space, the homeowners also replaced all the home’s existing siding to HardiePlank– which was painted a cheerful yellow by the homeowners. Made from only the highest-quality materials, this upscale siding offers flexibility in architectural style which can greatly increase your home’s value. Found on over 5.5 million homes, HardiePlank siding is the most popular brand of siding in America due its strength, beauty and durability. 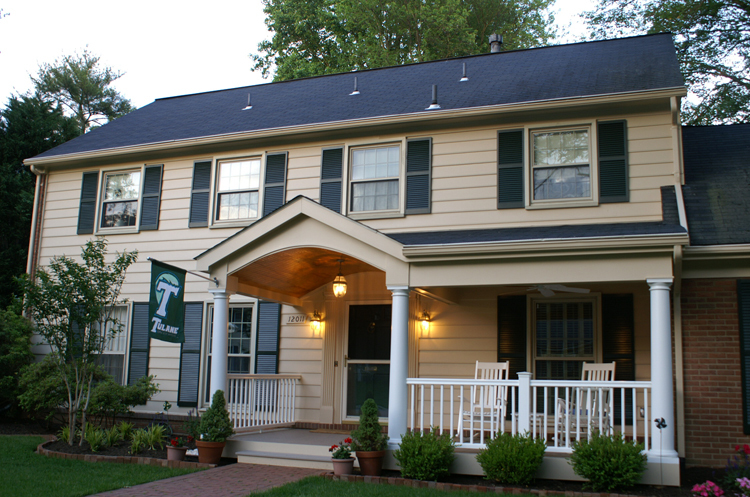 In these “after” pictures, notice how Archadeck of Central Maryland transformed the entire look of this turn-of-the-century brick colonial home. 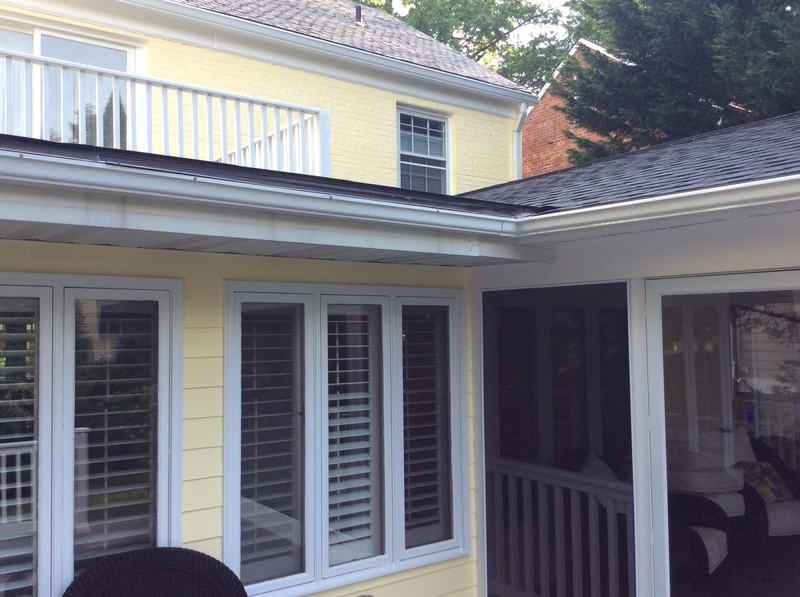 We were able to blend the screened porch roof into the existing flat roof of the home using a gable roof design with an open screened gable. 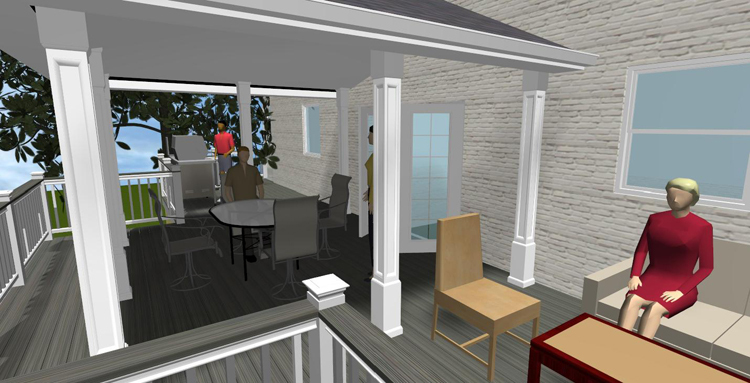 This architectural element provides ample light and ventilation to the porch area which will be just right for outdoor dining and socializing. In an effort to increase the enjoyment hours and reduce the amount of time spent on maintenance, the entire structure was built using low maintenance materials. The deck was constructed with Trex Select decking inside the screened porch and across the entire surface of the deck, vinyl trim was used inside and outside of the screened porch and the ceiling is beaded 1×6 tongue and groove vinyl to create a more finished look for the interior…again, all low-maintenance materials. The finished space is a highly versatile and positively stunning outdoor living combination area that the family is very happy with and one which they will enjoy for many years to come. And, as you can see from this picture, the homeowners’ two daughters love the space so much they have already placed their little outdoor living furniture settee in their favorite spot. If you are ready to give your outdoor living space the renovation it needs to create a beautiful new favorite spot for you and your family, contact Archadeck of Central Maryland to plan, design and build an unforgettable outdoor structure in which you all can make new memories. (301) 926 – 3001 or via email at centralmaryland@archadeck.net. 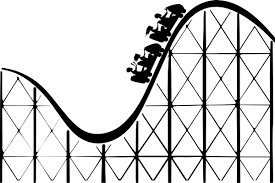 Gravity…awesome to experience on a roller coaster or slide…not so great on you deck! Knowing that gravity is an unfailing force is comforting, usually. It makes anything not firmly planted beneath the earth’s surface or properly attached to a stable structure eventually tumble to the ground. This thought doesn’t pop into your head until the moment you step onto something that wobbles or moves, even one that does it ever so slightly…such as walking across a swinging bridge in the mountains or while boarding a plane or ship…all of which you know to expect some movement. You should absolutely never experience this is when stepping out onto your deck; the most beloved spot for entertaining and relaxing. A well maintained, routinely inspected deck is one that gives you peace of mind each and every time you step on to it. 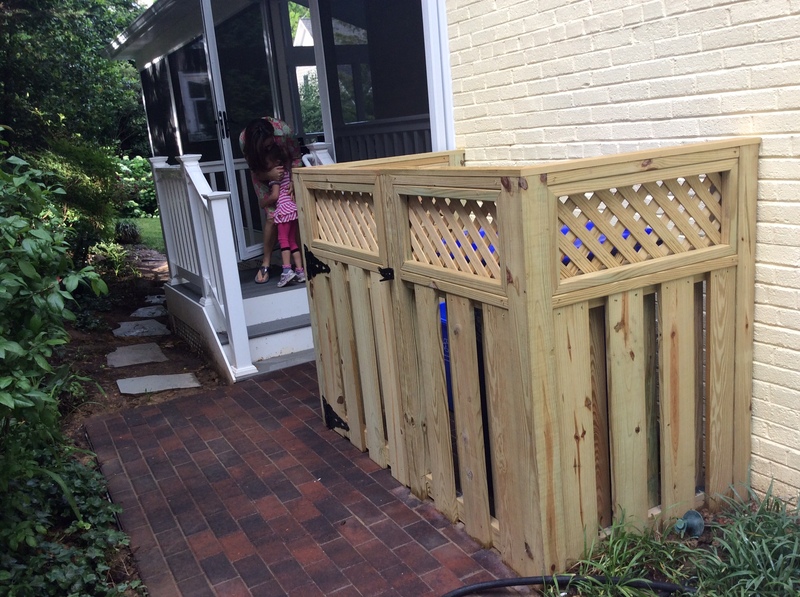 May, in the building industry is recognized as National Deck Safety Month and even though Archadeck of Central Maryland and Montgomery County helps to increase deck safety awareness during May, we feel deck maintenance should actually be conducted year-round to ensure safety. With a large portion of the approximately 40 million decks over 20 years old in the US, not being properly maintained or routinely inspected, it isn’t surprising that in a six-year period there were an estimated 179 deck failures resulting in 1,122 injuries and 33 deaths. What is startling, however, is the fact that according to NADRA, The North American Deck and Railing Association, deck failures that result in injury are increasing at an alarming rate and are mostly due to non-maintained, aged decks or just shoddy workmanship of a cut-rate builder. 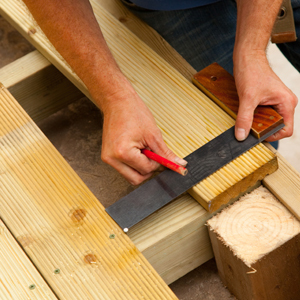 If a deck is built by a reputable experienced builder, it will be built correctly meeting or exceeding building codes, and give you peace of mind in knowing your deck is safe and structurally sound from the ground up. 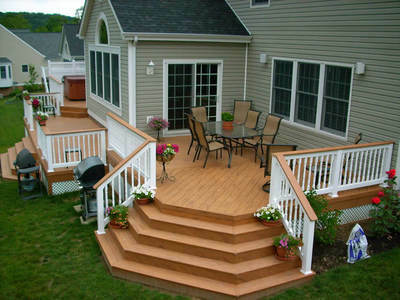 A well-built deck that is both structurally sound and safe also includes the following components: ledger boards that are either bolted or screwed securely to side of the house; support posts that are mounted to concrete footers; diagonal and/or lateral post braces, proper railing and stairs as well as connectors and fasteners (such as galvanized or stainless steel bolts, screws, nails and joist and post connectors) specially designed for deck construction. Just as it is with yours or your loved ones’ health (keeping an eye out for potential symptoms or health issues), when it comes to your deck’s safety, YOU are its first line of defense as well. And, since each of your family member’s health is directly affected by the safety of the things you use, you are killing two birds with one stone, so to speak. It’s as simple as doing a visual inspection of the deck each time you use it or are outside near it. If you see any rotten, cracked or damaged wood, or any loose, missing or corroded metal bracing or parts, it is recommended to have a structural engineer or an established, well-respected contractor evaluate your deck before its next use. Deck safety is a top priority and we want to ensure you or a member of your family doesn’t become a casualty as a result of an unsafe deck. 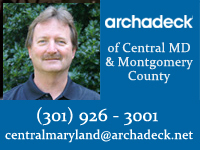 Archadeck of Central Maryland and Montgomery County offers a thorough, certified deck safety inspection for a modest fee. You’ll receive a detailed checklist that highlights any necessary or suggested repairs or maybe your deck is good for a couple more years; we’ll let you know that too. 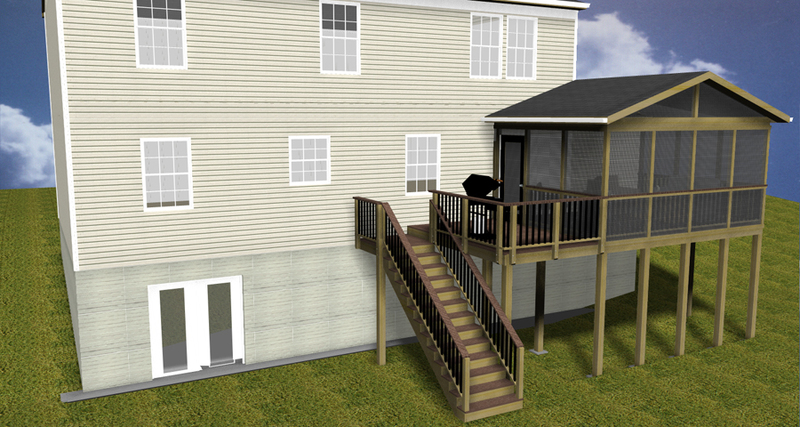 Here are just a few of the critical areas our deck safety inspection covers: foundation and footings, the attachment to your home, decking boards, connections and fasteners, the posts, beams and joists (if visible) of the structure, any sagging between supports, as well as stairs and rails. While we’re there to perform the inspection and upon your request we can also provide a free consultation on what would be involved with replacing your deck with an updated design that meets or exceeds all building code requirements and is best suited for your outdoor living needs. 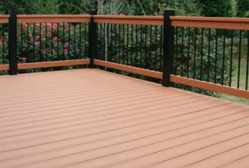 If you feel it’s time for your deck to be inspected for safety or are considering a new deck, or re-deck in the future, Archadeck of Central Maryland is the right choice for you. Our professional and talented staff members are experts at producing beautiful, quality outdoor living structures which are well designed and structurally sound. 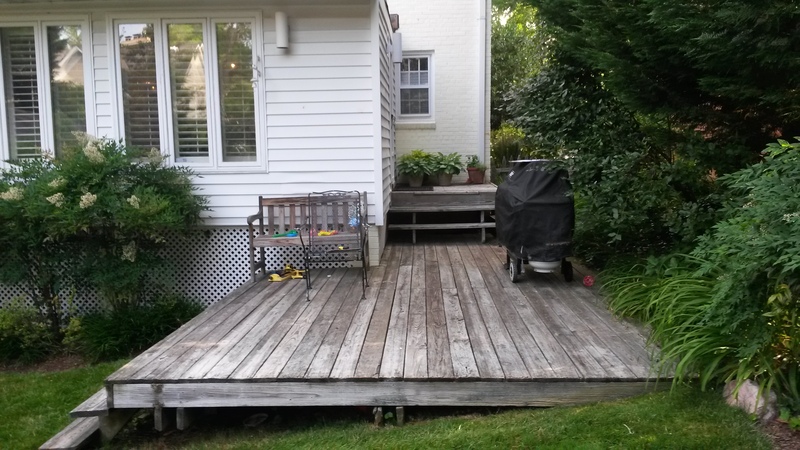 Contact us to learn more or to schedule your deck inspection or new project consultation today at (301) 926 – 3001 or email at centralmaryland@archadeck.net or montgomeryco@archadeck.net. When considering options for your Central MD deck, do you bamboo? 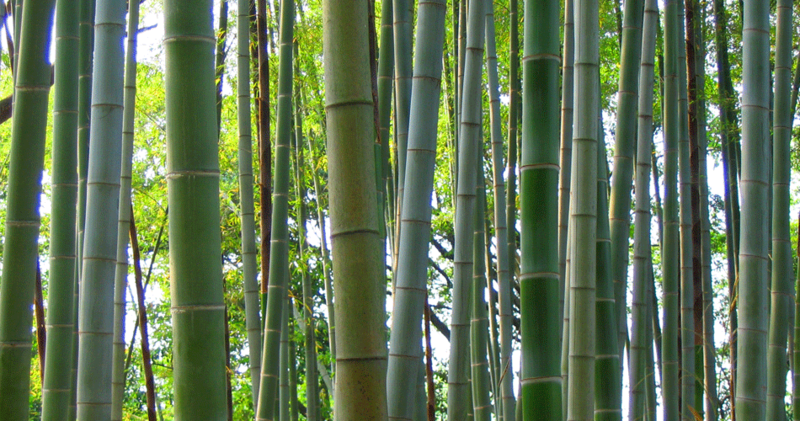 Used to create everyday objects for over 4000 years, bamboo’s long life makes it a Chinese symbol of longevity. Although most people think of it as a hardwood, it is actually a natural grass. A highly stable material, it is stronger and more durable than nearly all wood. All of these desirable attributes combined with its amazing longevity quite simply make it an ideal building material for outdoor living spaces, such as decks and patios, with a luxurious and exotic flare. 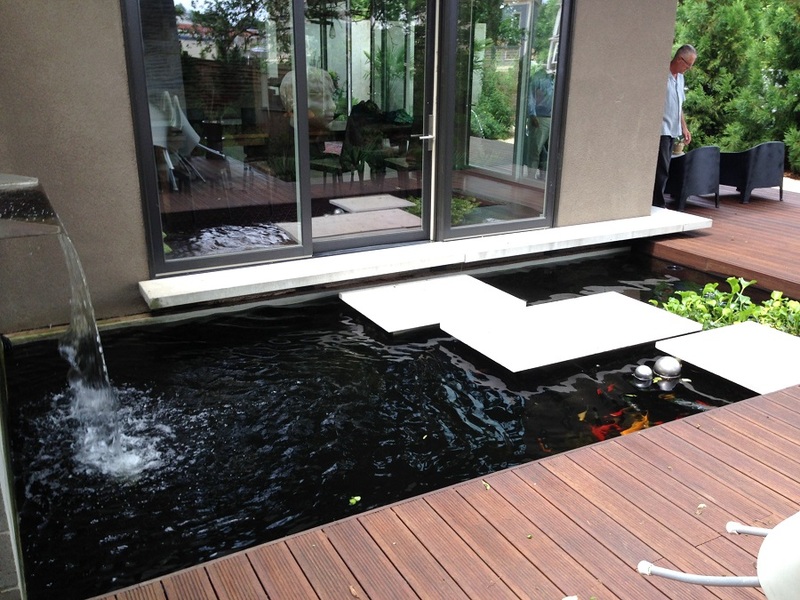 Tranquil bamboo deck alongside a Zen inspired water feature. Photo courtesy Dasso XTR. Over time, it’s inevitable for weather, sun and moisture to cause wooden boards to warp and twist. Wood will swell as it absorbs water and then shrink as it dries out again. Some types of boards are less likely to be seriously affected by the changes and some are drastically affected. Bamboo has a natural resistance to these elements and in comparison, will not swell or contract with moisture in the air. With its hard exterior and cellular interior, it is both flexible and elastic, making it very resilient without breaking. Bamboo does not have rays or knots the way wood does, so when stress is applied, it is evenly distributed over the surface. 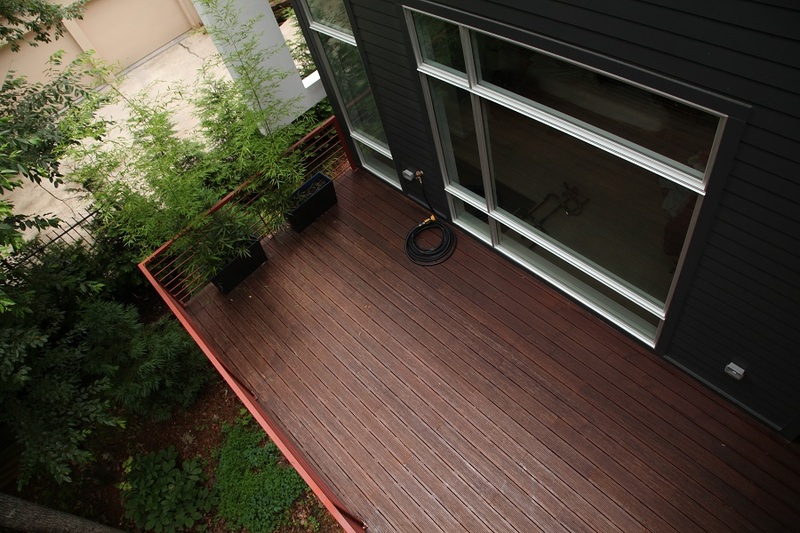 Knowing all these benefits of bamboo, it’s easy to see why bamboo decking has become so popular in recent years. Versatile in terms of color, bamboo can coordinate with almost any exterior décor of your home, as it can be stained in a wide range of hues from light natural to dark chocolate tones, allowing you to create just the right aesthetic for your particular project. As for maintenance to keep its exotic appeal, it requires no more work than you would need to do for a hardwood deck and the actual maintenance is very similar. This rooftop deck is built using bamboo decking. Our most current deck project is under construction. We are using bamboo furnished through Dasso XTR bamboo decking. Dasso is the global leader in the development and production of innovative bamboo products and is manufactured with strand woven technology, a patented process that fuses carbonized bamboo to make it suitable for exterior use. These homeowners can rest easy knowing their deck will stand up to whatever Mother Nature throws at it. Be sure to check back with us to see the progress and the final reveal of this stunning outdoor living structure. Archadeck of Central Maryland is a leader in outdoor design & construction in Montgomery County, Howard County, and the surrounding area. We strive to continue to offer our clients the most current design and most dependable building material options in the industry. Our professional and talented staff are experts at helping homeowners, like you, get the most out of every season. Contact us today to learn more at (301) 926 – 3001 or email at centralmaryland@archadeck.net or montgomeryco@archadeck.net. We were recently asked what the upcoming top home improvement trends for decks and outdoor living space materials are for 2013. Since we here at Archadeck of Central Maryland work with many clients to create the perfect outdoor spaces, including decks, patios, sunrooms, screen porches, hardscapes, gazebos and more, we were happy to tackle the question. So what materials, techniques and types of projects do we think will dominate 2013? Short answer: Top materials trends we’re seeing are Cap Stock materials & PVC technology. And a more thorough answer: Three technologies exist today for producing low maintenance decking: composite, cap stock and PVC. Composite was first introduced by Trex and is still available from all of the major manufacturers today. However, composite is prone to staining, scratching, fading and is more susceptible to mold and mildew. Many of the composite product do not look very natural. Its only advantage today is cost. As a result of the improved products on the market composite is quickly losing market share. Many of the products have been discontinued and those still in production will likely not be around much longer. We’re seeing a trend in PVC Technology using top-notch materials like Azec and Fiberon. The benefits of using these types of materials for decks and outdoor living areas are that it’s stain-, mold- and scratch-resistant. The product can dent, but is a lower price point, and we’re seeing a growing number of decks and outdoor structures constructed from it. PVC is generally the most expensive material compared to the other materials we’ve already described. Another top 2013 trend for outdoor structure materials are Cap Stock materials. These are recycled wood and recycled plastic on the inside with an acrylic, high density polypropylene or other propriety formulation shell. This provides extra protection for the boards and helps extend the life of the deck. Cap Stock has all of the stain, mold, mildew resistance as PVC, looks more like natural wood, is almost as scratch resistant, and is lower in cost than PVC. As a result this has been the most popular choice for customers looking for the best value in low maintenance flooring. All of the major manufacturers including Trex, Fiberon, TimberTech (acquired by Azek in August 2012) and some of the other lower profile manufacturers like Rhino Deck all offer this technology. We’ll be sharing more top home improvements trends and projects right here on our blog, so feel free to email us any related questions and we may feature your query in a future blog post! 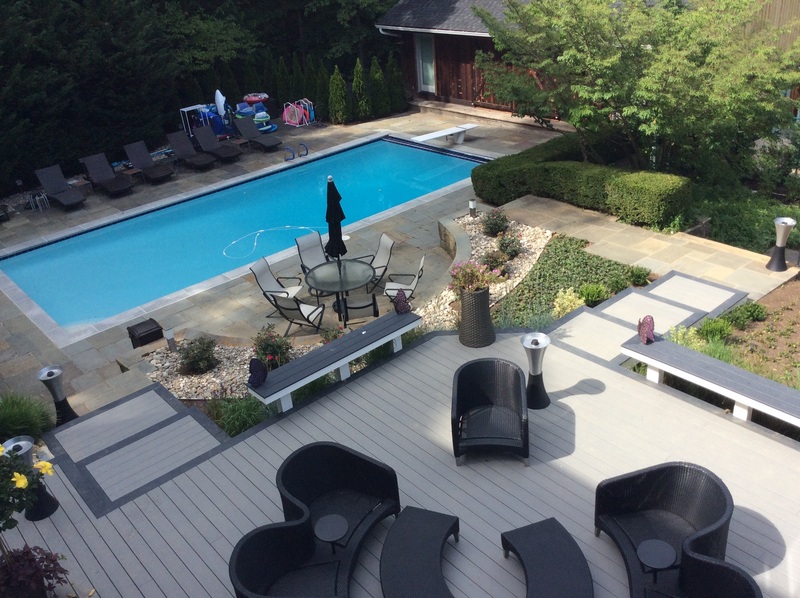 Archadeck of Central Maryland is a leader in outdoor design & construction for Montgomery County, Howard County, Anne Arundel County or Prince Georges County MD. 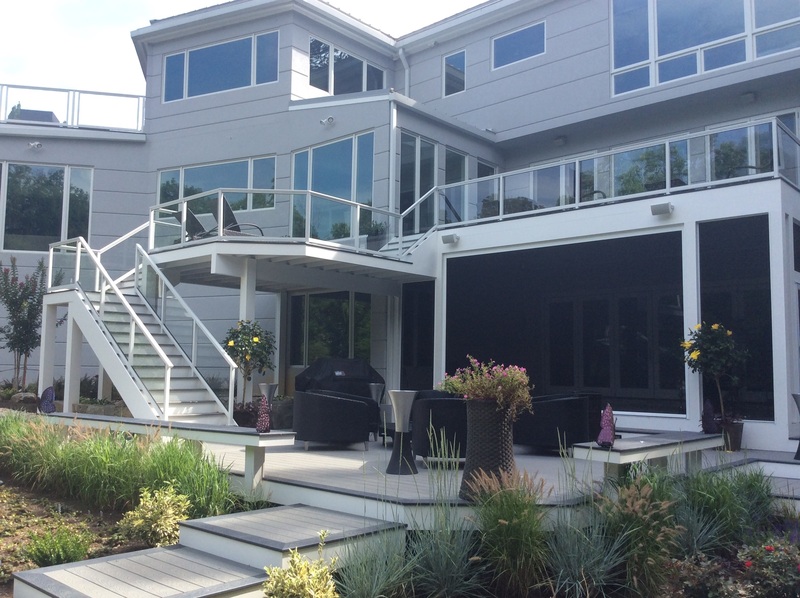 Our team has been designing & constructing outdoor living spaces for the past 11 years and has been the recipient of CotY (Contractor of the Year) awards and other distinctions, plus featured in the Washington Post. 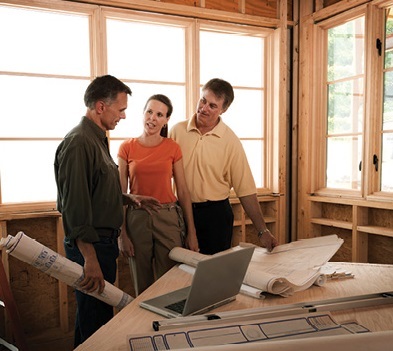 We’d love to help you with your next home renovation, whether you’re thinking of building a new deck, 3- or 4-season room, sun room, screened porch, patio, trellis, pergola, arbor, fire pit or other project. Our design consultation is free. Give us a call at 301-926-3001 or email us to schedule yours today. Last month we were pleased to be featured in the March 2012 Traditional Home Magazine and Country Living Magazine. Our 2012 Archadeck ‘Outdoor Living Design Guide‘ was featured as a resource for homeowners looking to enhance their outdoor spaces. If you’re interested in requesting your own downloadable copy, click here. You’ll valuable information for homeowners interested in building or remodeling outdoor living spaces such as decks, screen porches, gazebos, trellises, hardscapes, and outdoor kitchens. 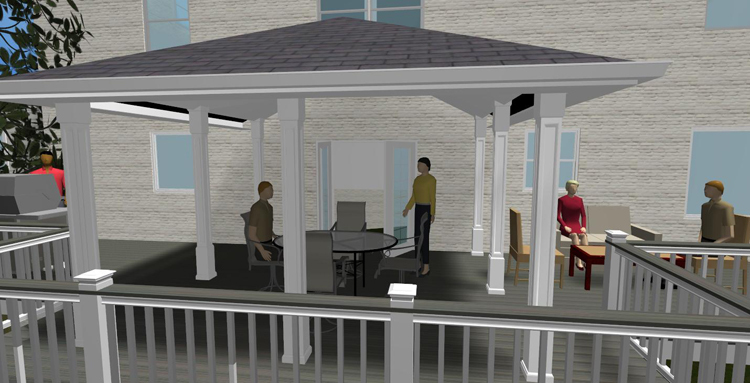 If you’re thinking about building a new deck, 3- or 4-season room, sun room, screened porch, patio, trellis, pergola, arbor or fire pit at your home in Montgomery County, Howard County, Anne Arundel County or Prince Georges County MD, give Archadeck of Central Maryland a call, we’d be happy to discuss your options and share what high quality projects we can create. Our design consultation is no obligation and free. Give us a call at 301-926-3001 or email us to schedule yours today. Maybe you can relate to this scenario… You move from your existing home into a home that offers more of what you need and want out of a house. The basis for your move may be a bigger home, a better address, a shorter commute to work or possibly all of the above. Once you get settled into your new location and it begins to feel like home you realize that the outdoor structure that you had at your previous home has been much more sorely missed than you would’ve ever imagined. Even though your interior living space exceeds your expectations, when you reminisce about the old deck and porch you left behind you find yourself humming the tune of the Michael Bolton song, ” how am I supposed to live without you”? This is exactly what happened to these Chevy Chase, MD homeowners upon their recent move. They really enjoyed spending time outdoors and they found themselves in a most unfortunate circumstance; their wonderful new home had no outdoor living space at all. Their old home had a nice deck that they used frequently and they contacted us to get the ball rolling to design an outdoor space for them to help quench their thirst for outdoor living. 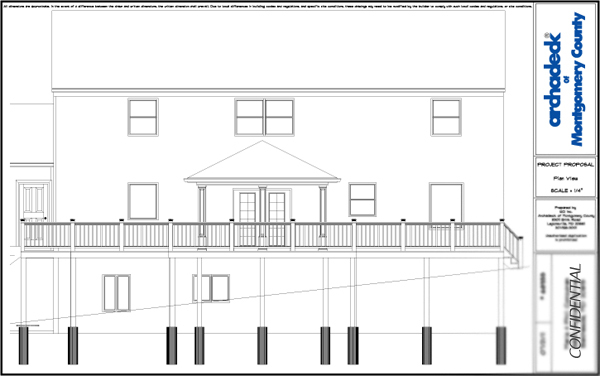 We set out to design an elegant and formal looking space for them that would incorporate a roomy new deck and open porch. The couple’s existing home is a two-story with a basement that grades up from one side to the other. Our challenge was to overcome the slope of the space as well as incorporate a large tree that the outdoor structures needed to harmonize with. Our solution was to concentrate our design on the homes rectilinear design to create a space that compliments the home, offers a comforting flow to and from the home’s interior spaces and lends itself to future projects in the back yard. We are constructing a deck which also includes a large rectangular open porch which matches the architecture of the house. The area will tie together with a hip roof on an open porch. The open porch is six plus feet above the grade of the lot so they will enjoy insect control because of the elevation. The french doors that are being installed off the home’s dining room will spill out onto the porch and will also provide access to the family room addition which was added to the home a few years ago. We are flanking either side of the doors which will serve as eating and seating areas. From one side of the open porch the homeowner will have close proximity to the interior kitchen. 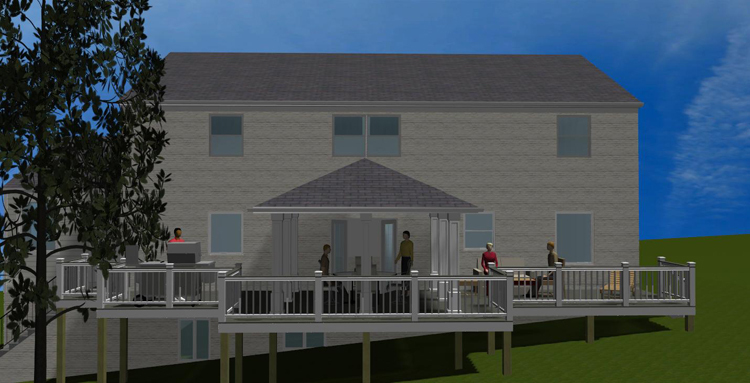 We also designed the deck to include the family barbecue area in close proximity to the kitchen area for ease and convenience when entertaining or dining outdoors. Since one of the homeowner’s wishes is to focus on the elegance within the outdoor space, the columns will be trimmed to blend the front exterior of the home and will make the design refined, tight and cohesive. 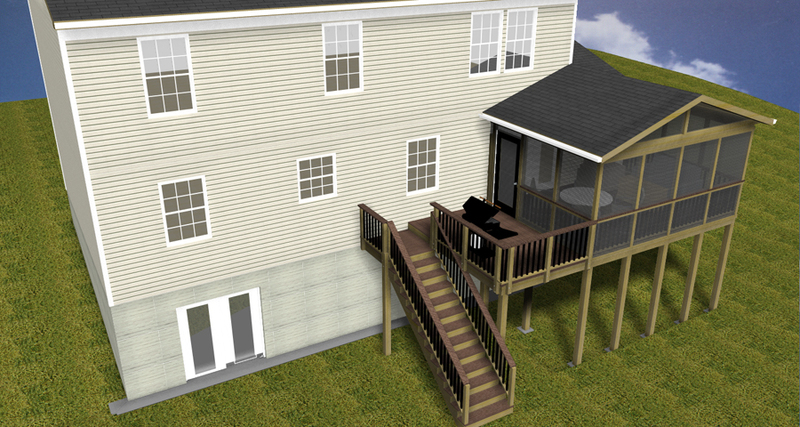 The stunning deck is designed to allow for future projects in the backyard as the homeowners see fit. 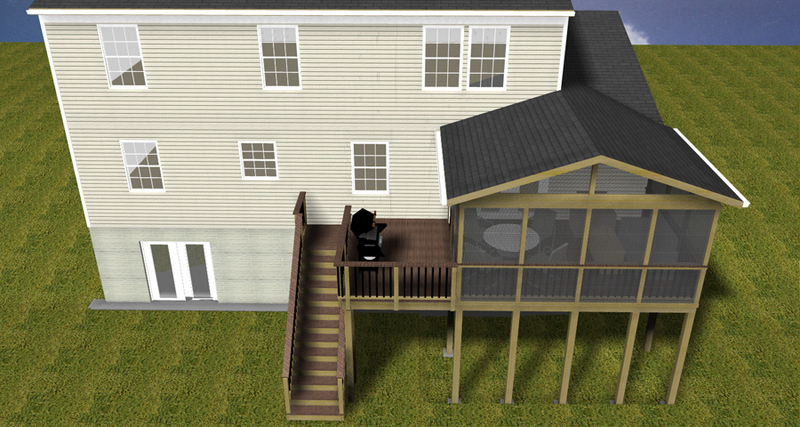 On the deck and open porch we are using Guardian Prestige in weather wood with Shoreline railings. The entire project was carved like a diamond out of the rough for these Chevy Chase, MD homeowners. Archadeck of Central Maryland and Archadeck of Montgomery County was able to overcome the designing obstacles with ease and perfection. 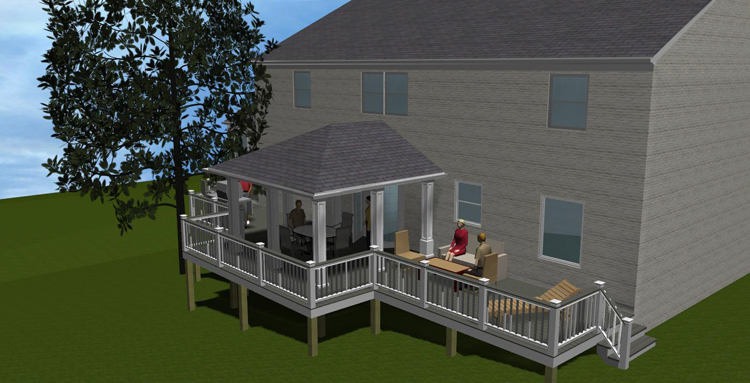 The homeowners are eager to enjoy their completed deck and open porch for many years to come. 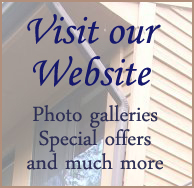 See more deck and open porch designs by Visiting our Deck galleries and porch galleries located on our website. Fill ‘er up with a new deck this year. What does the price of gas have to do with your new deck? 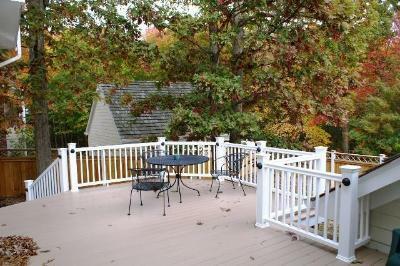 This deck by Archadeck of Central Maryland is constructed from AZEK, a composite decking material that looks lovely against the backdrop of autumn leaves. You can probably feel the sting in your wallet every time you visit the pump to fill up. With the ever-increasing price of gas, many aspects within our economy can be affected. Gasoline is derived from crude oil, which is a commodity, and like many other commodities when demand is on the rise, the price goes up. Everything from hand lotion, to dish washing detergents and even frozen foods are made using derivatives of crude oil in one form or another, and when the demand from crude oil rises, so do the prices we pay for these everyday items. This composite deck with pergola by Archadeck of Maryland, is just one example of the many outdoor structures we can have ready for you by spring. One aspect that is affected by the rising price of crude oil, is composite decking materials. One major component that goes into creating composite decking is plastic and plastic is a bi-product of refining crude oil . The plastic is costing the composite manufacturers more so the composite prices will increase. Throughout the year the trend in rising crude oil prices fluctuates and intermittent pricing of materials that are derived from crude oil will be affected, however through past price hikes we have seen a trend in crude oil prices experiencing a brisk rise during the month of December in recent years. 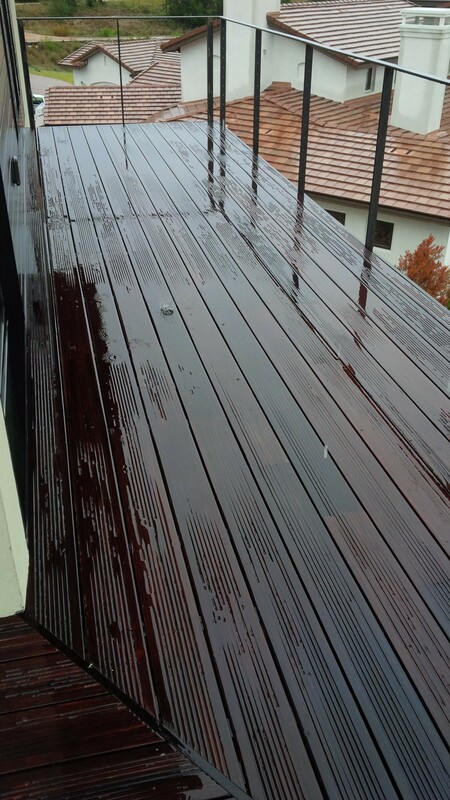 There is always an increase in composite deck materials which occurs twice a year. The increases are generally seen in December and during the mid-summer months. This means that deciding to go ahead and build that deck or outdoor structure you have had on hold now may save you quite a bit of green in the long run. Aside from the avoidance of rising composite prices, there are many other reasons why building your outdoor structure now, rather than later can benefit you greatly. Not only will you avoid the long lines and waiting periods that usually accompany Spring construction, your structure will actually be ready for you and your family to use and enjoy in the Spring. You can enjoy the first blooms of spring from your deck or outdoor structure instead of saying, ” I wish we already had our outdoor structure up and running”. There are also fewer winter weather delays now than in the months of January and February. The cooler weather conditions also means the crews can work longer hours because of the absence of the summer heat which can sometimes create a longer than expected building deadline to occur if weather conditions are too hot and require more hydration breaks for the workers. Another key aspect of choosing to build now is there is less damage caused to your turf and landscaping when materials and construction crews are upon it. Most plants and turf are dormant during the late fall and winter months which helps protect them from damage that may occur from construction, as well as cooler temperatures creating a firmer ground to work on with less risk of turf damage. 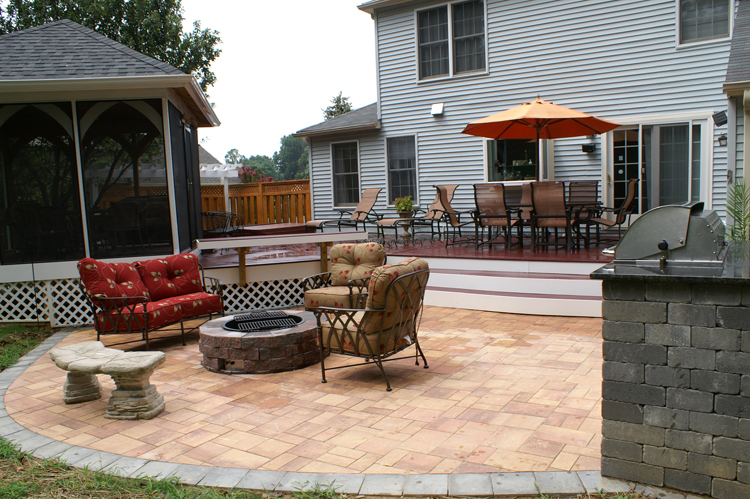 Archadeck of Montgomery County also encourages homeowners to consider building now because of the savings that can be accrued by just the concrete aspect of your outdoor structure. During the cooler months concrete is being poured below the frost line which means you can use cold water concrete and this can be poured down into the lower single digit temperatures, and financially this comes out to a great deal for the homeowner. This deck by Archadeck shows the beauty that can be yours with a composite deck. If you are yearning and dreaming of a new deck, patio or other outdoor structure choosing to build now can mean a big difference in the savings, and in having your structure sooner than you could’ve imagined by avoiding the spring backlogs. Even choosing to wait until April or May to begin construction could put you into mid-summer having your structure completed. Right now Archadeck of Montgomery County is offering up to $2,500 off your project if you sign up before the end of 2011. Our offer gives you 10% off with a cap of $2,500, contact us for details. 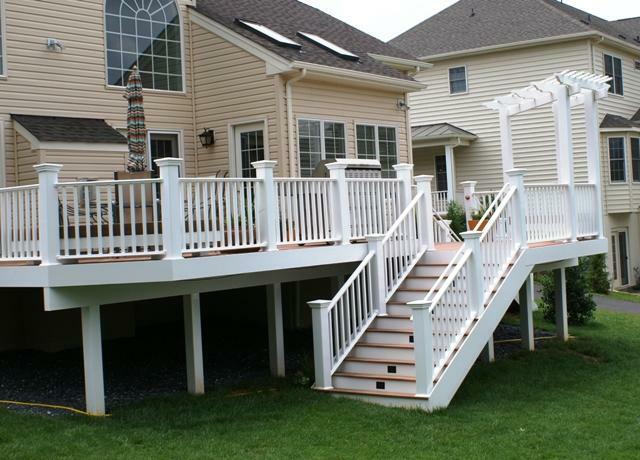 For more beautiful composite and PVC deck designs, visit our composite and PVC deck photo gallery on our website. 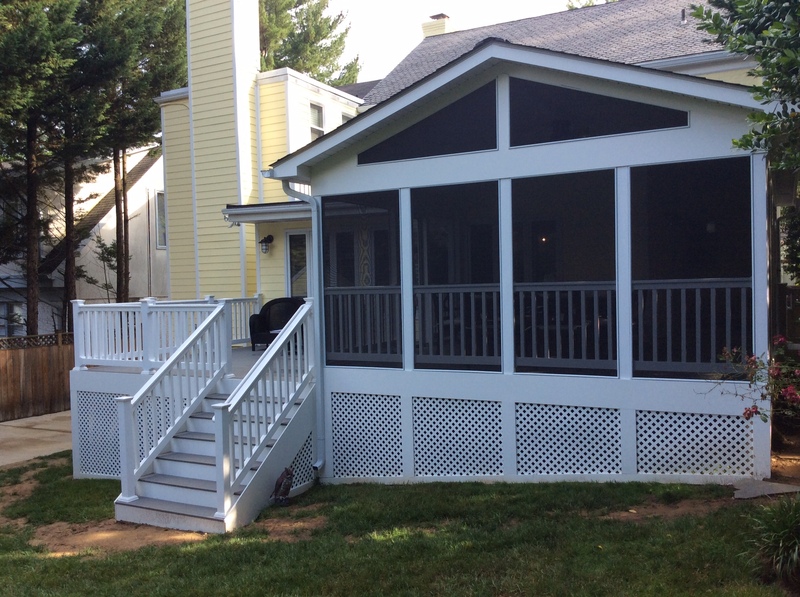 The addition of this portico by Archadeck of Maryland gives this Rockville, MD home a new look. In a world where first impressions mean everything, making the decision to upgrade your front entry or front porch can add tremendous curb appeal to your entire home. 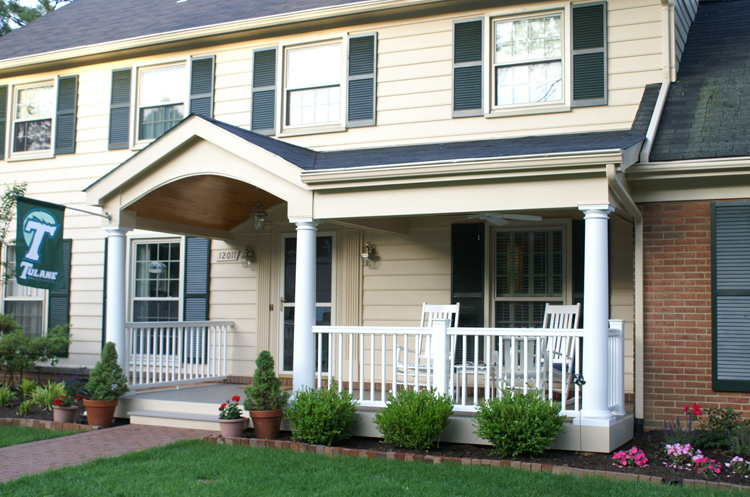 A front porch or portico addition can make your home appear larger and more inviting. When you look at the dynamics of design and construction, many times little things can mean a lot. Changing a small area of a home can make a tremendous impact on how the home feels, and especially in the way the home is perceived. Making changes to areas such as entrances, porches or even a upgrading your front door can improve upon your homes aesthetic appeal and play a role in how visitors and guests feel as they enter your home. This photo shows the new and improved front porch area perfect for these Rockville, MD homeowners to enjoy their beautifully landscaped front yard. These Rockville, MD homeowners recently contacted us to transform their home’s front entrance to not only beautify the front entrance but to also provide them with the ability to enjoy their beautiful front yard within a “rocking chair” front porch environment. By adding the front portico to this already nice looking home, we were able to provide all this and a great deal more for these Rockville homeowners and turn the residence into a stunning structure which is alive with timeless elegance. 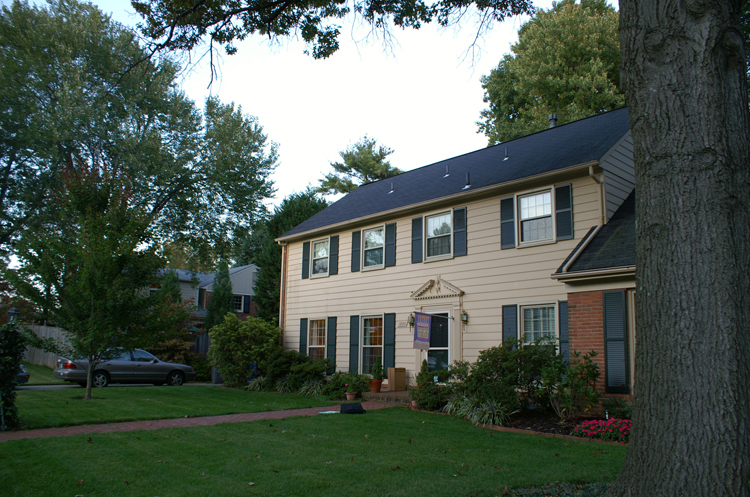 This is the "before" photo of this Rockville, MD home before Archadeck of Maryland added the front portico to the structure. Their home is a circa. 1960’s traditional two-story colonial with an attached 2-car garage constructed in brick and clap siding. The front door to the home was a standard door with federal style trim. This home although classic in its design, was built during a period in architecture when entrances to homes were not considered to be a prominent feature in the home’s design. We set our sights on changing this to a front entrance that would become a focal point for the home and also encompass everything that the homeowners desired to achieve by transforming this area of their home. 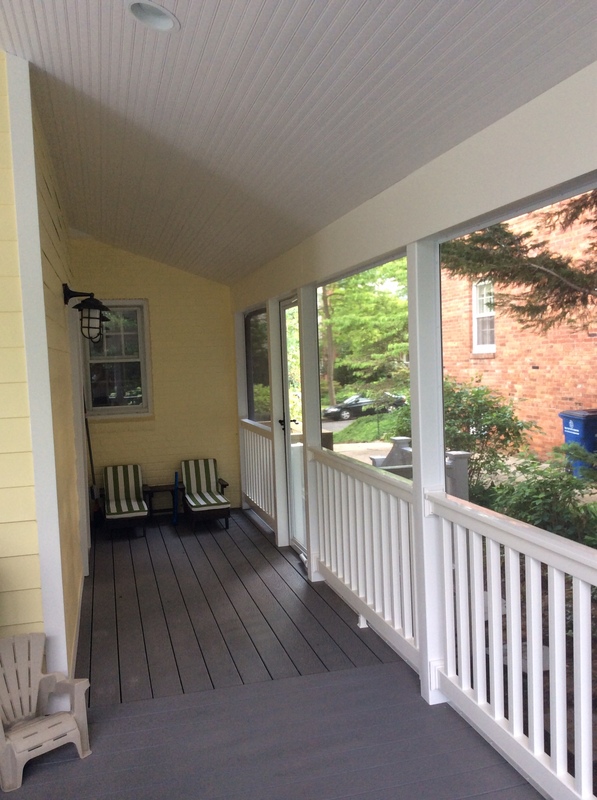 Archadeck of Central Maryland and Archadeck of Montgomery County built a front porch over half of the front between the family room kick out with low maintenance tongue and groove AZEK porch flooring which allowed for continuity of the home’s traditional style. We then add footed columns on either side of the porch which give the portico a regal and stately feel as you enter. 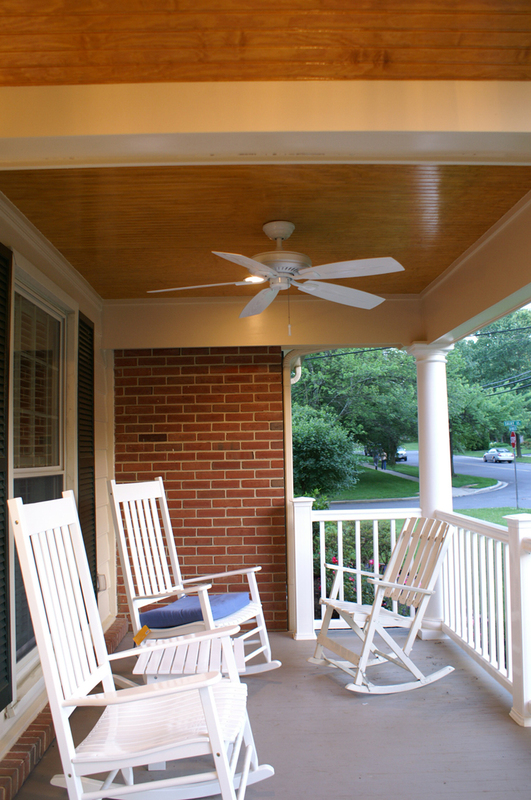 We even added ceiling fans to make the portico easy to love even when the weather is warm. The end result is a stunning transformation that looks original to the home and gives the entire house a new look. 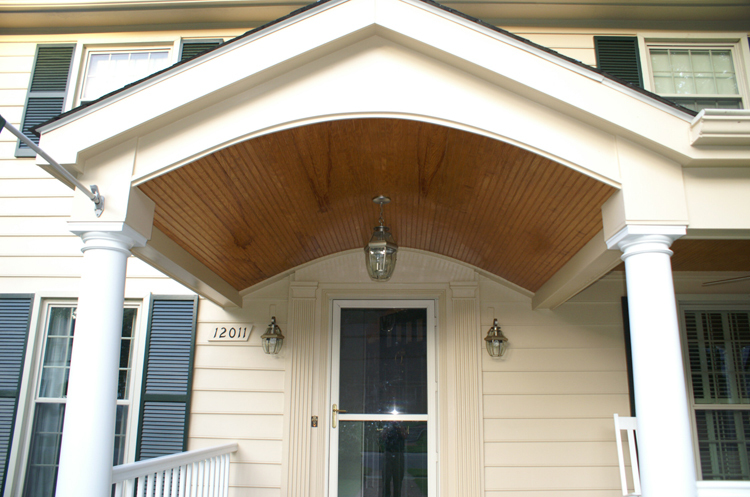 The homeowners couldn’t be more pleased with their new portico that looks original to this classic structure. They can now enjoy their front yard season upon season, and receive guests in style with this gracious portico. 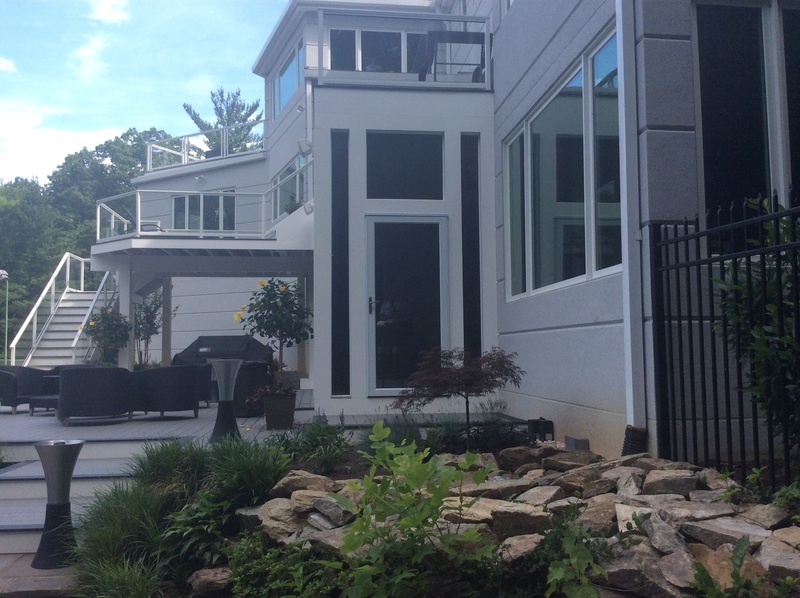 The new portico changes the whole dynamic of this Rockville, MD homes design.